From the author of Outrun the Moon, Stacey Lee's debut novel is a powerful story about love, friendship, and sacrifice. Perfect for fans of Code Name Verity. All Samantha wanted was to move back to New York and pursue her music, which was difficult enough being a Chinese girl in Missouri, 1849. Then her fate takes a turn for the worse after a tragic accident leaves her with nothing and she breaks the law in self-defense. With help from Annamae, a runaway slave she met at the scene of her crime, the two flee town for the unknown frontier. But life on the Oregon Trail is unsafe for two girls. Disguised as Sammy and Andy, two boys heading for the California gold rush, each search for a link to their past and struggle to avoid any unwanted attention. Until they merge paths with a band of cowboys turned allies, and Samantha can’t stop herself from falling for one. But the law is closing in on them and new setbacks come each day, and the girls will quickly learn there are not many places one can hide on the open trail. 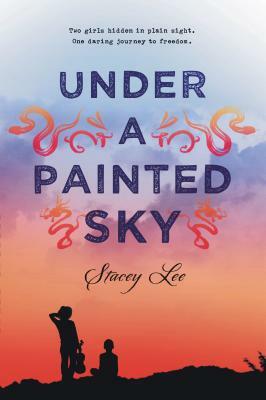 Stacey Lee is the critically acclaimed author of the novels Under a Painted Sky and Outrun the Moon, the winner of the PEN Center USA Literary Award for Young Adult Fiction. She is a fourth-generation Chinese American and a founding member of We Need Diverse Books. Born in Southern California, she graduated from UCLA and then got her law degree at UC Davis King Hall. She lives with her family outside San Francisco. You can visit Stacey at staceyhlee.com. Or follow her on Twitter @staceyleeauthor.